Rain Master's iCentral system is a low-cost Web-hosted service that turns any RME Eagle-i controllers into a wireless Internet-enabled device and providing central control capabilities through any web browser! The iCentral system has been engineered for water management conscience irrigation contractors and end users who require fundamental central control capabilities without the complexity of more comprehensive systems. Using your PC, simply connect to the Rain Master iCentral Web site via the Internet and enter a user name and password. Simple intuitive operations allow programs to be managed effortlessly. iCentral has the intelligence to obtain daily ET data (ZipET) for each Eagle-i satellite site(s) and automatically adjust programs on a daily basis without operator intervention. 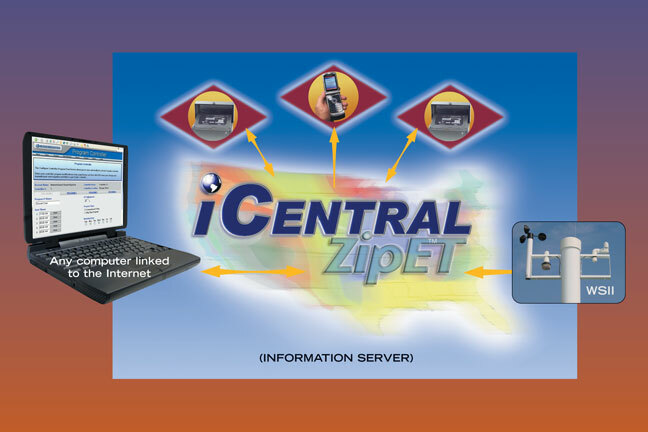 The iCentral with Eagle-i controller and ZipET has met or exceeded the Irrigation Association "Smart Controller" guidelines and specifications to insure maximum water savings anywhere within the United States (Incl AK & HI).